DMS Halloween Costume Contest in Rettner Hall, 1–3 p.m.
Do you have an awesome Halloween costume? Would you like to capture yourself wearing it? Come to Rettner Hall on Halloween (concurrent with Rush Rhees Library's Scare Fair) and get yourself scanned! 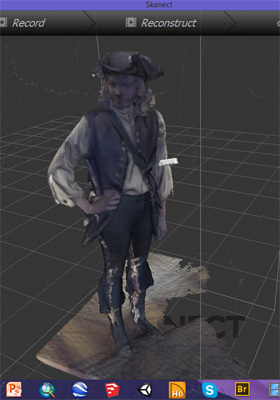 DMS students will laser scan you and give you a digital copy of yourself in costume (bring your own flash drive), which is suitable for 3D printing. Three contest winners will score 3D printed action figures of themselves in their costumes. To host this event, we need volunteers willing to be trained in 3D scanning and able to work that day. Training sessions will be held the week before Halloween. Please contact Michael Jarvis (Michael.jarvis@rochester.edu) to volunteer.